As we know Milk for drinking makes our skin smooth nice and lots of benefits for the skin. Let us look at why i love the Latest Biotherm Body Milk Ritual Products. A legend was born – Biotherm Body Milk. Its unforgettable scent and pleasurable texture created a beautiful memory that lingers forever in the mind. This lotion, with its delectably natural fragrance, has become one of Biotherm’s cult products. Milk that hydrates and nourishes your skin. A sparkling citrus fragrance that gently awakens your spirit. An anti-dryness texture that deeply moisturises your body. A symbol of original happiness and comfort, milk evokes soothing and reassuring sensations. Simple but rich, sensuous and voluptuous, milk infuses the skin with its nourishing benefits and deeply hydrates the skin. The softest and most moisturizing of caresses for the body, mind and the senses. Every twenty seconds somewhere in the world, a woman gives in to her desire for Body Milk! A pure moment of beauty and sensual pleasure. Applying Body Milk is tender,generous pampering in a single gesture that comforts and revitalizes your senses instantly. The ultra-fluid texture glides easily over the skin and penetrates quickly. Thanks to the anti-dryness ingredients at the heart of the formula—glycerin, olive oil,Vitamin E—and pure thermal plankton, the skin is moisturized, supple and soft. The Fragrance Fresh & Light. Sparkling top notes and refreshing middle notes of orange and grapefruit—a burst of energizing citrus scents. Pure relaxation thanks to essential oil of sweet orange, which stimulates blood circulation and tones muscles & anti-stress action from essential oil of grapefruit. The history of milk rituals dates from Antiquity. This custom was known and celebrated for its therapeutic benefits. Legend has it that Cleopatra, the Queen of Egypt, remained a great beauty thanks to the luxurious milk baths she had every day. These baths had exceptional moisturizing, nourishing and regenerating virtues for the skin, since milk had the power to keep the skin young. But Cleopatra was not alone to revel in the pleasures of milk. Poppaea, wife of the Roman emperor Nero, used milk to preserve the radiance and suppleness of her skin. Empress Messalina used it to make beauty masks and King Francis I of France had it prescribed as a miraculous cure! My Review on Biotherm Body Milk Ritual Srub , Exfoliate. I like the fine beads that is soft for the skin. As i massage and lather it in my shower, it is nice and creamy , and rinses of my skin feels smooth and soft with a protective film. It does not feel dry 🙂 i love it! All the gentleness of a body milk In an ultra-creamy energizing scrub. Exfoliation that feels wonderful! An ultra creamy and gentle body scrub in a soap-free emulsion, formulated like a skincare product: A unique, unprecedented sensual pleasure! Smoothes the skin without drying and leaves a feather-light veil of softness. My review for the Body Milk Ritual Shower Cleanser, love the citrus essence that smell refreshing and make me love the shower sensation with it. It gives my skin a thorough cleanse and my skin do not feel tight and itchy after using. A true shower cleanser with an energizing scent that melts into milky softness. The soap-free formula is enriched with extra moisturizing oils to protect dry skin, and contains citrus essences which leave a fresh, delicate scent on the skin. 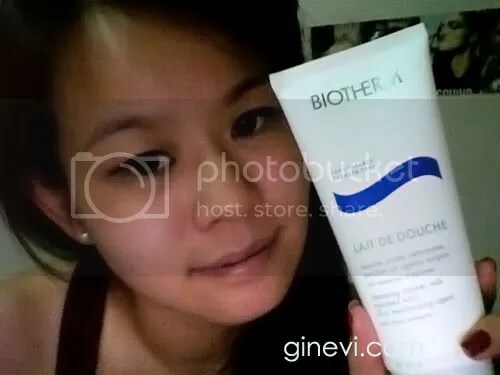 My Review on Biotherm Milk Ritual Body moisturizer, i love this skin wakening moisturiser , the texture feels rich and creamy, i have apply in the morning after shower, it lasts the whole day and my skin doesnt feel dries or roughly or itchy. It does not feel sticky or oily after using it. i really love this milk moisturizer.